How Does Solstice East Help Teens with Asperger’s Syndrome? Solstice East is a cutting-edge and progressive residential treatment facility helping teenagers with Asperger’s Syndrome. We believe in implementing a holistic approach that begins with trust and building a relationship with the patient. Asperger’s Syndrome is unique in that it can go undiagnosed in girls for many more years than with boys. Because of this frequent misdiagnosis, girls with Asperger’s, âfrequently struggle with self-harm, disordered eating, anxiety, depression, and many other issues. Teenage girls also have a much harder time with Asperger’s when they reach puberty because their hormones are out of control. Solstice East helps treat teenagers with Asperger’s Syndrome in a variety of therapeutic approaches. We also create a safe and healthy environment for all of our patients. Our staff takes the time to assess what treatments may be beneficial to our patients. We frequently treat Asperger’s with a variety of therapies, psychiatric services, nutritional evaluation, physical fitness, and academics. What are the Causes of Asperger’s Syndrome in Teens? As with most neurological disorders, the exact cause is unknown. Aspergers may result from a combination of genetic and environmental factors that cause changes in brain development. Aspergers tends to run in families, suggesting that some cases may be hereditary. Depending upon whether one believes Asperger’s Syndrome is synonymous with autism, the causes could be relative to that of autism. Aspergers may come from a genetic component and has been observed to run in families. Environmental influences include: toxic exposures, teratogens, problems with pregnancy or birth, and prenatal infections. These influences may act together to modify or potentially increase the severity of the underlying genetic defect. Not all cases of AS are diagnosed early, because the signs are not always apparent until teenagers reach an environment that is concentrated around stress. difficulties are often not recognized until the demands of their environment increase. This can happen as late as early adulthood, when the individual leaves high school for college. Whatever the exact cause(s) are of AS, teenagers living with the syndrome need to be equipped with the proper coping mechanisms in order to live a successful life. 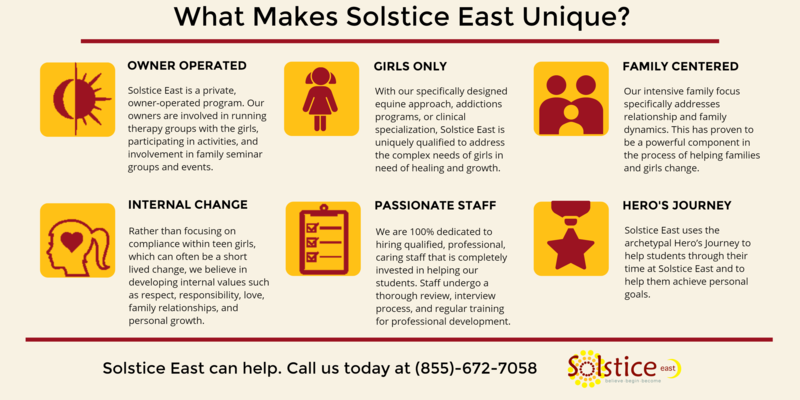 Solstice East, a residential program for teens struggling with aspergers, provides teens and their families with specialized therapeutic approaches to begin the healing process. Our experienced therapeutic staff are passionate about their work with students. Much of our therapeutic philosophy is based on a holistic approach – treating the entire individual (mind, body, and soul) rather than a âproblem areaâ. Many challenges stem from core issues affecting the entire individual. We seek to uncover and target those challenges in order to help students heal and find an inner peace. 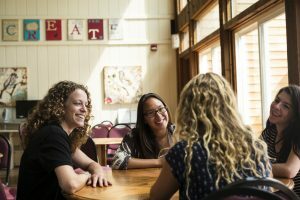 Another aspect of our therapeutic programming that makes us unique from other residential programs that help treat aspergers is our focus on building trusting relationships. Many of the students we help have found that their relationships with family members and peers have deteriorated over the years due to aspergers. A central part of our philosophy is âpeople before programsâ. We do this by creating a positive community-focused campus and helping students rebuild their relationships with family members. Throughout their time at Solstice East, students undergo a process of internal growth and change implemented by specific programming encouraging the development of positive values. During their therapeutic journey, students learn how to use these positive values to drive their choices and behaviors moving forward. 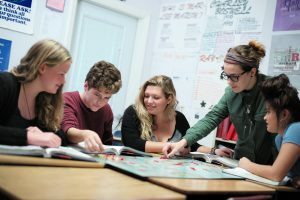 Solstice East helps teens with Asperger’s Syndrome by utilizing a holistic and academic approach. We believe that mind, body, and soul work together to create a proper balance in life. We work on all aspects of the body and help teenagers learn the skills to live successfully with Asperger’s Syndrome. A common therapeutic option for AS is mindfulness based cognitive therapy. This type of therapy allows the patient to see their emotions, and learn to take control of them. When their compulsions and routines are placed in front of them, they can be taught the proper tools to decrease those routines. We also focus on treating other aspects that go along with AS such as: anxiety, depression, self-harm, eating disorders, and other traumatic-based occurrences. We also mix in academic learning, nutrition assessments, physical fitness, socialization, psychiatric help, and other therapies in order to heal the individual. Creating a safe and healthy environment is the first step in the gradual process of healing. Why Should Parents Choose Residential Programming For Aspergers in Teens? Sending a child away to a residential program can have powerful benefits for the child and the family. Ensures the immediate safety of the child and family at home. Removes the immediacy of communication- âknee jerkâ responses to anger or frustration are eliminated while the child can learn new, healthy ways to deal with their emotions. Removes child’s current stressors, peer group, and temptations. Serves as a total reset for the family. Communication can resume slowly. Ensures the child is focused on the therapy and peer group of the facility, not in attempts to get their friends to ârescueâ them from local treatment. Improves accuracy of assessment: outpatient treatment relies on the child accurately recounting events, feelings, and behaviors sometimes days after, whereas at inpatient program assessment is in real-time. Ensures the confidentiality of the child. At a local facility, the child will likely encounter peers or even form relationships with individuals that could potentially continue after treatment. Psych Central Truly a hub of all things mental health, Psych Central is an independently-run website featuring input from mental health professionals worldwide. Containing descriptions of various mental health issues, frequently asked questions, and a forum section in which users and professionals can come together to help each other, Psych Central is an unparalleled resource. APA One of the leading psychological communities in the world, the American Psychological Association has more than 100,000 members representing all areas of the field working professionals, scientists, students, educators, and more. The American Psychological Association works to improve the qualifications of psychologists by implementing higher standards of ethics, education, conduct, and achievement.